Because eL Seed works almost exclusively in the Arabic script, that message is tough for any Arabic speaker to miss. 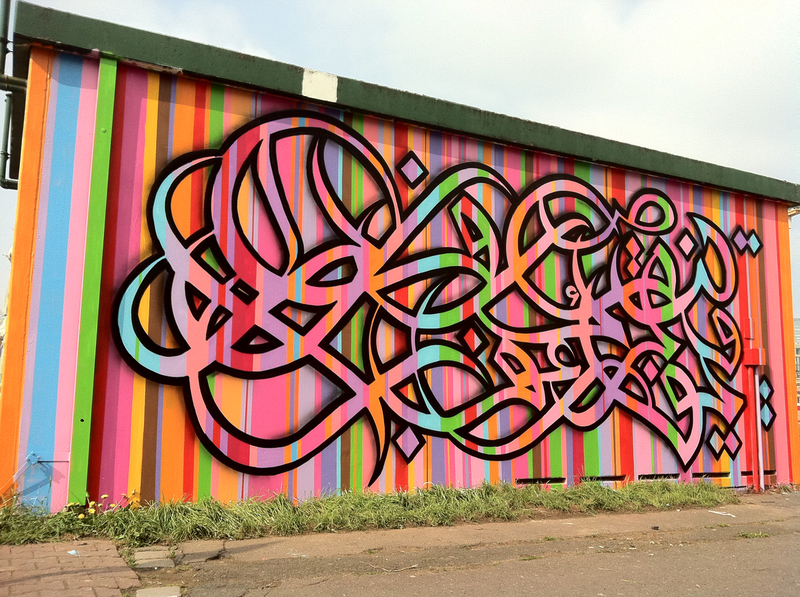 In the Western world, the sheer beauty of what eL Seed calls his "calligraffiti" has earned him earnest, if a little lost, fans. But eL Seed himself talks about the script as shape -- ones a viewer doesn't necessarily have to decode to appreciate it. As far as art camps go, you could call him more Picasso than Duchamp. "If I don't feel it, I can't paint it," he told the Huffington Post via email. "I do generally sketch out the work, but sometimes it's much more visceral and I shoot straight from the head." We recently had the pleasure of chatting with eL Seed (a stage name he based on the French book "Le Cid," or "The Master"). He was enthusiastic and thoughtful about his work, and had surprising insights into the highly publicized battles in Tunisia over censorship. Scroll down for captioned examples of eL Seed's work, and read on for his take on his art, his country, and the infinite malleability of the Arabic script. HP: Has there been any blowback to your work? ES: I haven't experienced any particularly bad reactions. Most of them are either marginal, down to personal beliefs, or simply about aesthetic taste. I did receive some mixed attention around the [Jara Mosque] mural, but most of it was hot air and false polemics. A few articles tried to position the mural as something that could be 'haram' or blasphemous for some, [but] most presented the project in a favourable light. The international media covered the project quite extensively. Social media and blogs were also very positive about the project, both outside and within Tunisia. However, the reaction from the media in Tunisia was nil. No major Tunisian channel, newspaper or magazine chose to cover the project - in my view, because it presented a message of unity and tolerance, not the usual sensational cover story of religious hooligans versus opportunistic secularists. For me, this lack of interest in positive news shows a desire to divide and create polemics in order to feed news channels, rather than promote an advancement of dialogue and fruitful national debates. This I found very disappointing. HP: How do you make text-based images continually interesting? ES:With Arabic calligraphy, each letter has an infinite amount of ways to be re-drawn. You don't find the complexity of Arabic calligraphy in any other language so it us easier to constantly reinvent it. Much of my work process is about letting the viewer interact with the letters without necessarily being able to read them. HP: We read a lot about artists in Tunisia protesting censorship. What constraints do you face? ES:I feel that there is a lot of hypocrisy in Tunisia at the moment, and unfortunately many artists relish censorship, or the fear of it, if it brings them international recognition. I personally have not felt any real threats of censorship. HP: Which artists do you admire? ES:The list is long but today when I am talking to you I would say Sundus Abdul Hadi, the Iraqi artist and Mahmoud Darwish, the Palestinian poet, both for their work and their courage. HP: What are the messages you hope to get across? ES:I hope to get across to people that dialogue leads to positive encounters. I always hope to break a few stereotypes or barriers each time I paint.